A privately built space plane performed its first-ever drop test Saturday (Oct. 26), but experienced a landing gear malfunction after what appeared to be an otherwise successful flight, according to statements by NASA and the space plane's builder. The Dream Chaser space plane, built by the Colorado-based Sierra Nevada Corporation (SNC), carried out its first unmanned approach and landing test over the weekend at Edwards Air Force Base in California. As the spacecraft prototype neared the runway, the vehicle encountered a glitch with its left wheel, according to Sierra Nevada officials. During Saturday's test, the Dream Chaser space plane was released from a helicopter carrier aircraft at approximately 2:10 p.m. EDT (11:10 a.m. PDT). The spacecraft then flew and glided back autonomously before the accident occurred on Runway 22L at Edwards Air Force Base. "While there was an anomaly with the left landing gear deployment, the high-quality flight and telemetry data throughout all phases of the approach-and-landing test will allow SNC teams to continue to refine their spacecraft design," Sierra Nevada officials said in a statement. Company officials said glitches are to be expected in designing a new spacecraft, and this weekend's malfunction will act as a valuable learning experience. "As with any space flight test program, there will be anomalies that we can learn from, allowing us to improve our vehicle and accelerate our rate of progress," Sierra Nevada officials said. 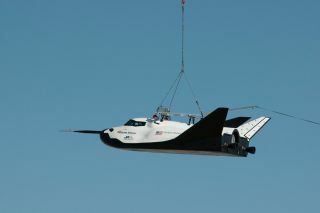 The Dream Chaser space plane resembles a miniature space shuttle, and is being developed to carry astronauts to and from the International Space Station, and other destinations in low-Earth orbit. The seven-passenger vehicle is about 29.5 feet (9 m) long and has a wingspan of 22.9 feet (7 m). Sierra Nevada is one of three companies — together with SpaceX and Boeing — to receive funding from NASA's commercial crew program, which aims to foster the development of new spacecraft to replace the agency's space shuttles, which were retired in 2011. SpaceX and Boeing are both designing capsules, and Dream Chaser is the only reusable winged spacecraft being developed under NASA's commercial crew program. NASA hopes at least one of the new vehicles will by 2017. The agency currently relies on Russian Soyuz spacecraft to transport astronauts to and from the International Space Station.